SQL Power Data Migration and Integration Services goes well beyond basic data movement, taking the risk out of your DM initiative and helping you meet the demands for new information in a timely fashion. In this information age, more and more users are demanding timely and accurate access to new information. Implementation of CRM systems, data warehouses and new operational systems have resulted in a flood of data migration and conversion requests that your organization may not be sufficiently staffed to deliver. Now there's no reason to say no to end-user demands for new information. For a fraction of the anticipated cost, SQL Power can help with one-time data conversions as well as with ongoing data migration efforts. This includes data analysis, data mapping, data transformation, data cleansing and data auditing. Secure access to source data subject matter experts. Expedite the source data analysis by utilizing a data profiling tool. Utilize an ETL tool for all data migration processes. Supplement your team with seasoned data migration experts. Build cross-reference tables between source and target system identifiers. Secure access to business users and target application experts. Test the target application on the migrated data, verifying all the application functionality. Run the legacy and the target applications in parallel for a period of time, and compare key measures and standard reports. Audit source vs. target data, identifying any data discrepancies or data migration issues. Present the data audit results to IT management and business users, thus providing them confidence that their data was migrated accurately. Through a proven data migration design philosophy, SQL Power consultants have successfully architected and implemented numerous complex data migration and data integration projects, experiencing first hand legacy data intricacies and the complexity surrounding data cleansing, data migration and data transformation. These experiences have equipped our consultants with numerous proven solutions to the many intricate data migration problems. Having these readily available solutions in our artillery serves to expedite our data migration implementations, and affords us the ability to concentrate on our clients' truly unique data issues. We pride ourselves on being data migration experts. Our success and unmatched track record in this arena can be attributed to our proven design philosophy, highly trained consultants and the use of high-end productivity tools. SQL Power data migration experts will ensure that your data conversion effort will be done right, on time and within budget. The main challenge in building decision support environments is to provide complete, accurate data and to create connections between the various disconnected data sources, thus providing a complete view of each key dimension. SQL Power data cleansing services will scrub your data, validate and correct addresses, identify and remove duplicates, and build cross-references between source and target tables. This results in giving your end-users complete and accurate data, and a single 360-degree view of each customer, product, sales rep and business unit. Duplicate data or disconnected views reduces the integrity and efficiency of your business intelligence environment. Your data warehouse may currently have multiple views of the same customer, which means you're not getting the complete picture. A clean, consolidated view of your key dimensions can give you the real story behind the data. SQL Power data cleansing services will guarantee the integrity of your decision support database, thus providing your users with a clean, reliable and accurate business intelligence environment. Database queries don't have to be unpredictable. SQL Power data cleansing services can be used for initial database cleanup efforts, or on an ongoing basis to ensure that future data loads and future interfaces do not compromise the integrity of your database. The cost of making business decisions based on incomplete or inaccurate data can be huge: even the best executives can make the wrong business decision when it's based on the wrong data. But ensuring that data is synchronized between various systems is a difficult task often ignored by organizations - until key indicators derived from different solutions don't match. SQL Power helps you avoid this with automated data auditing solutions that allow you to uncover data discrepancies BEFORE the business users do. 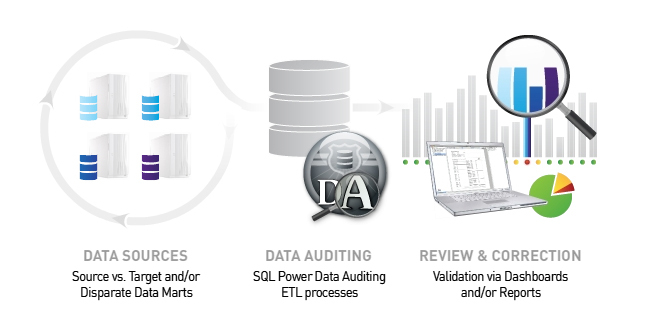 SQL Power data auditing services will continuously monitor your BI environment and data sources, ensuring that any discrepancies are quickly identified - thus providing the organization with an "early-warning system" and allowing IT to correct the issue in a timely fashion. SQL Power's data auditing service is offered as part of our data warehouse development, or may be utilized against existing solutions. SQL Power has successfully delivered data auditing solutions for new system rollouts, data migration efforts, and ongoing regular data loads - confirming the integrity of the systems and providing timely results to the business. Data integrity status is always communicated throughout the organization quickly so that the business can act quickly.